Pelham Bay Park is a public park located in the northeast corner of the New York City borough of the Bronx and extending partially into Westchester County. It is, at 2,772 acres (1,122 ha), the largest public park in New York City. The section of the park within New York City's borders is more than three times the size of Manhattan's Central Park. The park is operated by the New York City Department of Parks and Recreation. Anne Hutchinson's short-lived dissident colony, along with a number of other unsuccessful settlements, was located in what is now the park's land. The colony, though English, was part of New Netherland under Dutch authority; it was destroyed in 1643 by a Siwanoy attack in reprisal for the unrelated massacres carried out under Willem Kieft's direction of the Dutch West India Company's New Amsterdam colony. In 1654 an Englishman named Thomas Pell purchased 50,000 acres (200 km²) from the Siwanoy, land which would become known as Pelham Manor after Charles II's 1666 charter. During the American Revolutionary War, the land was a buffer between British-held New York City and rebel-held Westchester. As such it was the site of the Battle of Pell's Point, where Massachusetts militia hiding behind stone walls (still visible at one of the park's golf courses) stopped a British advance. The park was created in 1888, under the auspices of the Bronx Parks Department, and passed to New York City when the part of the Bronx east of the Bronx River was annexed to the city in 1895. Orchard Beach, one of the city's most popular, was created through the efforts of Robert Moses in the 1930s. In 1941, the New York City Police Department used land from the park to create the Rodman's Neck Firing Range on the Rodman's Neck section of the park. About 600 acres (2.4 km²) are tidal, and fluctuate between being walkable and underwater, due to rapid tide changes in the salt marshes and the receding shoreline of Orchard Beach. The park includes land on both sides of the Hutchinson River, and Hunters Island, Twin Island, and Two-Trees Island, all formerly true islands in Pelham Bay and now connected to the mainland by fill. It borders the Bronx neighborhoods of Country Club, Pelham Bay, City Island, and Co-op City. ^ Twomey, Bill (2007). The Bronx: In Bits and Pieces. Rooftop Publishing. p. 107. ^ New YorkMathis-Lilley, Ben, "The Neighborhood News," , p. 15. ^ New York City Department of Parks and Recreation. "Split Rock/Split Rock Trail". Retrieved 2015-04-19. ^ "Places to Visit". Friends of Pelham Bay Park. Retrieved 20 April 2015. ^ McNamara, John (1993). History in Asphalt: The Origin of Bronx Street and Place Names. Bronx County Historical Society. p. 189. ^ "Kazimiroff Nature Trail - Historical Sign". New York City Department of Parks & Recreation. Retrieved 2009-08-21. ^ LaPlante, Eve (2004). American Jezebel, the Uncommon Life of Anne Hutchinson, the Woman who Defied the Puritans. San Francisco: Harper Collins. p. 239. ^ "Split Rock: a Pelham Landmark for Centuries". Retrieved 2011-08-23. ^ Gross, Jane (1997-05-06). "A Tiny Strip of New York That Feels Like the Suburbs". The New York Times. Retrieved June 9, 2012. ^ "Bronx Riviera Photos Perfectly Capture New York's Summer Spirit". HuffPost Arts & Culture (Huffington Post). August 20, 2013. Retrieved March 25, 2014. ^ a b Forero, Juan (July 9, 2000). "Slice of the Riviera, With a Familiar Bronx Twist". The New York Times. Retrieved 2009-08-15. ^ "Pelham Bay Park". New York City Department of Parks & Recreation. Retrieved 2008-04-27. ^ a b "The Bronx Victory Column & Memorial Grove". Pelham Bay Park Virtual Tour. New York City Department of Parks & Recreation. Retrieved 2008-04-27. ^ Douglas Martin (1994-05-01). "A Critical Tour of the Empire: Battery Park to High Bridge . . .". The New York Times. Retrieved 2008-04-27. Around 1900, a land berm was created across Turtle Cove for rails for horsecars. This berm caused the north end of Turtle Cove to become mostly freshwater, which attracted freshwater drinking rare birds in the meadow. A 3-foot (0.91 m) diameter concrete culvert was placed across the berm to allow salt water from Eastchester Bay, but leaves and vegetation blocked this culvert. In 2010 NYC Parks removed the old culvert and dug a trench with a backhoe machine to make a canal that floods the north end with salt water, which drives away the freshwater birds. The city Parks department placed an attractive foot bridge that allows park users to walk across this new canal and along the ancient land berm. Washington's Journals recalls the Battle of Pell's Point took place at the isthmus of Anne's Neck near some huge boulders by a freshwater meadow. Located north of Orchard Beach, the Hunter Island Marine Zoology and Geology Sanctuary encompasses all of Twin Islands, Cat Briar Island, Two Trees Island, and the northeastern shoreline of Hunter Island. It contains many noteworthy geological features including glacial erratics, large boulders that were deposited during the last ice age nearly 15,000 years ago. The rocky coast of Twin Islands, reminiscent of the New England shorefront, is the southernmost outcropping of Hartland Schist, the major bedrock component of such coastlines. The sanctuary supports a unique intertidal marine ecosystem that is rare in New York State. The Thomas Pell Wildlife Sanctuary makes up the westerly part of Pelham Bay Park (2,764 acres). Included within its bounds are Goose Creek Marsh and the saltwater wetlands adjoining the Hutchinson River as well as Goose Island, Split Rock, and the oak-hickory forests bordering the Split Rock Golf Course. The area is home to a variety of wildlife including raccoon, egrets, hawks, and coyotes. The Sanctuary is named for Thomas Pell, the first European to control the land. Thomas Pell Wildlife Sanctuary and the Hunter Island Marine Zoology and Geology Sanctuary consist of a total of 489 acres (1.98 km2) of marshes and forests within Pelham Bay Park. The City began landfill operations near this area on Tallapoosa Point in Pelham Bay Park in 1963. Plans to expand the landfills in Pelham Bay Park in 1966, which would have created the City’s second-largest refuse disposal site next to Fresh Kills in Staten Island, were met with widespread community opposition. This struggle resulted in the creation of the sanctuaries by a local law, signed by Mayor John V. Lindsay on October 11, 1967. Built in 1933, the Bronx Victory Column & Memorial Grove is a 75-foot-tall limestone column that supports a bronze statue of Winged Victory on Crimi Road in the park. While officially a memorial to servicemen from the Bronx, it is also a favorite location for wedding photography. The grove of trees that surround the statue were transplanted from the Grand Concourse when construction began on the IND Concourse Line (B D trains). In 2010, construction began on the beach jetty, extending the jetty. Approximately 268,000 cubic yards of sand were pumped onto the beach to replace sand lost over the years. The sand was dredged from the Ambrose Channel by a Great Lakes Dredge & Dock Company hopper dredge, the Padre Island, working under a contract with the U.S. Army Corps of Engineers. These acts will make the beach safer for swimmers. While surrounded by acres of natural forest, marshlands, and coastline, the beach is actually man-made. Urban planner Robert Moses came up with the concept and planned its construction. The process involved filling in approximately one third of Pelham Bay with landfill, followed by a total of 1.2 million cubic yards of sand brought by barge from Sandy Hook, New Jersey and the Rockaways in Queens. The landfill was placed among Rodman's Neck, Twin Island, and Hunters Island; the latter two are no longer islands since being connected to the mainland Bronx by the landfill. The beach opened in 1936. 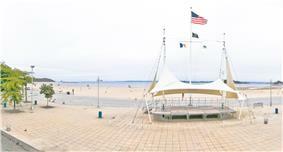 Orchard Beach, a public beach, is part of Pelham Bay Park. Sometimes called the Bronx Riviera, the 115-acre (0.47 km2), 1.1-mile (1.8 km)-long (1.77 km) park consists of a 13-section sandy beach, a hexagonal-block promenade, a central pavilion with food stores and specialty shops, two playgrounds, two picnic areas, a large parking lot, and 26 courts for basketball, volleyball, and handball. It is operated by the New York City Department of Parks and Recreation and is most recognized for its unique crescent shape and beautiful view of City Island, Bronx. Orchard Beach: a 115-acre (0.47 km2), 1.1-mile (1.8 km) long beach, man-made under Robert Moses' supervision in the 1930s and the only public beach in the Bronx. The Bartow-Pell Mansion and Museum: an elegant example of 19th-century architecture. Split Rock: at the Hutchinson River Parkway's intersection with the New England Thruway; legend says that Anne Hutchinson, an early proponent of religious freedom, was killed here. The Bronx Victory Column & Memorial Grove: a 75-foot (23 m) tall limestone column supporting a statue of Winged Victory, honoring servicemen from the Bronx who lost their lives defending their country. Glover's Rock: a giant rock bearing a bronze plaque commemorating the Battle of Pell's Point during the Revolutionary War. Hunter Island: a small island, home to the Kazimiroff Nature Trail. Rodman's Neck: an isthmus connected to the rest of Pelham Bay Park via going into Westchester County. Thomas Pell Wildlife Sanctuary: mostly salt marsh; egrets and heron can often be seen. The Orchard Beach Nature Center is open on weekends from Memorial Day through Labor Day. The Pelham Bay Nature Center is open for scheduled programs and by appointment. Bicycle paths go to all parts of the park and west to Bronx Park, east to City Island, and north to Mount Vernon. The park is the home of the Bronx Equestrian Center where visitors can ride horses through the parks' trails, enjoy pony rides or obtain riding lessons. At the northeast section of the park is Orchard Beach and a parking lot that were created by Robert Moses as the Riviera of Long Island Sound. One third of Pelham Bay, from which the park got its name, was filled in with landfill to make Orchard Beach. The park is crossed by the New England Thruway, the Hutchinson River Parkway, and Amtrak's Northeast Corridor railroad. In the southeast section of the park, near the New England Thruway, there are four softball/baseball fields, a playground for children, picnic area, tennis courts, a parking lot and several trails for walking/biking/running. Moreover, there is a large running track that was recently renovated. The renovation was part of the New York City 2012 Olympic bid. This track has a bleacher section off to its side and surrounds a grassy area that is used for both soccer games and football games. There are three overpasses that span the New England Thruway and bring parkgoers from the residential area of Pelham Bay directly into this section of the park. At the southwest corner is the New York City Subway's Pelham Bay Park station on the 6 <6> trains. North of the park is the village of Pelham Manor in Westchester County, and a 250-foot-wide strip of land that is part of New York City due to a boundary error. Owners of the several dozen houses on the strip have a Pelham Manor zip code and phone numbers and their children attend Pelham public schools, but as Bronx residents pay much lower property taxes than their Westchester County neighbors. The southern part of Rodman's Neck is not part of the park but is occupied by the NYPD Rodman's Neck Firing Range. A lagoon nearby was once part of Pelham Bay and was called LeRoy's Bay in colonial times. The lagoon was widened and dredged when it was chosen as the site of the 1964 Olympic Rowing trials. To the southeast, the City Island Bridge connects the park to City Island. A 19th-century plantation-style mansion called Bartow-Pell Mansion is a colonial remnant done in Greek revival style. It is a National Historic Landmark. The boulder is of enough historic importance that in the 1950s officials were persuaded by the Bronx Historical Society to move the planned Interstate 95 (New England Thruway) a few feet north to save Split Rock from being dynamited. It was saved by Dr. Theodore Kazimiroff, the society's co-founder. The nearby Split Rock Golf Course was named after the rock, as is a street in Pelham Manor, Split Rock Drive, less than 1,000 feet (300 m) to the north. The rock appears to be a glacial erratic that may have originated as far north as Canada. It derives its name from a large crevice dividing the stone into two half domes. The huge rock broke in half about 10,000 years ago under the stress of glacial movements. Another trail that is mostly used by horses leads from the parking lot at the south end of the Split Rock Golf Course to a point about 1 mile (1.6 km) to the north and west, where the rock is clearly visible and only about 150 feet (46 m) away. However, the heavily trafficked ramp from the northbound Parkway to the northbound Thruway passes between this point and the rock, and it is not safe or legal to cross it. Formerly yet another park trail, called the Split Rock Trail, led from Bartow traffic circle to the rock, but the paved trail is now mostly buried underground or in inaccessible vegetation, and only remnants of it are visible. Split Rock, a large dome-shaped granite boulder measuring approximately 25 feet (7.6 m) from north to south and 15 feet (4.6 m) from east to west, is located at the intersection of the New England Thruway and Hutchinson River Parkway, on a triangular parcel of land formed by these roads and a ramp that leads from the northbound Parkway to the northbound Thruway. The only public access to the rock is by a little-used pedestrian trail that begins on Eastchester Place, where that street makes a sharp bend as it meets the Hutchinson River, and leads about 1,500 feet (460 m) to the rock. After crossing under the Thruway, the trail turns left to run beside the northbound lanes of that road and then rises to share an overpass with it as it crosses the Parkway. The trail ends at the rock, which is located at the end of the overpass. Glover's Rock, a giant George Washington. Between City Island and Orchard Beach is a sound named Pelham Bay, but contrary to its name, it is not a bay since it is open to larger bodies of water at both ends. It connects to Eastchester Bay at the south, and opens onto Long Island Sound and City Island Harbor at the east. Pelham Bay was originally larger than it is today, because approximately one third of the original bay was filled in to create Orchard Beach in the 1930s. In April 2009, the owners of Rat Island put it up for sale for $300,000. Rodman's Neck has three meadows. One is a natural salt water meadow, and the other two are manmade freshwater meadows, one of which was created by Robert Moses's projects. The City Island Traffic Circle and several small ballfields also exist, while every original building has been razed. A landfill area for City Island Road crosses Turtle Cove Saltwater Marsh with a culvert made of concrete pipes connecting it to salt water Eastchester Bay. A second land berm built for horsecars, that was long forgotten, had its always-clogged three foot diameter culvert removed, and a trench with a stainless steel bridge was installed. The southern third of the peninsula is used as a firing range by the New York City Police Department; the remaining wooded section is part of Pelham Bay Park. The north side is joined to the rest of Pelham Bay Park, at Orchard Beach. Two small land berms between Rodman's Neck and City Island are City Island's only connecting point road to the mainland. The two islands that are now combined as Twin Island have been owned by the New York City Parks Department since 1888. 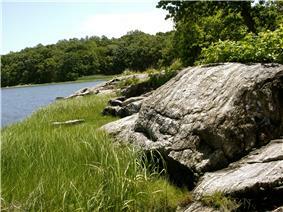 Twin Island, at , is wooded with exposed bedrock with glacial grooves. The East and West Twin Islands (or the "Twins") were once true islands in Pelham Bay but are now connected to each other and to Orchard Beach and nearby Rodman's Neck by a landfill created in 1937. East Twin Island is connected to neighboring Two Trees Island via a thin mudflat landbridge, which is submerged at high tide. West Twin Island was at one time connected to neighboring Hunter Island via a man-made stone bridge, that now lies in ruins in one of the city's last remaining salt marshes. Member species of the islands' salt marsh ecosystem include egrets, cormorants, fiddler crabs, horseshoe crabs, and marine worms. In 1967, Hunter Island was declared the 'Hunter Island Marine Zoology and Geology Sanctuary' by local law. The land holds the largest continuous oak forest in Pelham Bay Park, including white, red, and black oak, as well as black cherry, white pines, Norway spruce, and black locust trees. One can also find traces of John Hunter’s estate garden, which held grape hyacinth, periwinkle, daylily, and Tartarian honeysuckle. Much of the island’s natural features are found along the Kazimiroff Nature Trail, named in 1985 for Dr. Theodore Kazimiroff, a Bronx historian and champion of wetlands preservation. 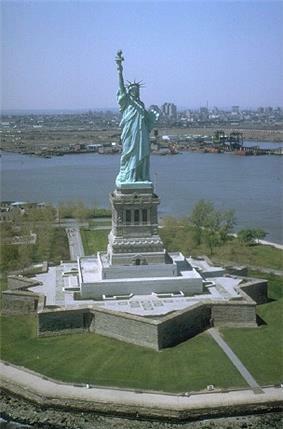 The City of New York purchased the island in 1889. In 1937, Parks Commissioner Robert Moses decided to dredge the sand of the Rockaways to fill LeRoy’s Bay during the construction of Orchard Beach. The Hunter Mansion, which had fallen into disrepair, was also destroyed during construction. When the massive project was finished, Hunter Island was connected to nearby Twin Island and Rodman's Neck, becoming part of Pelham Bay Park, originally designated parkland in 1888. The newly created land mass resulted in a one-mile crescent beach, a 6,800-car parking lot, a pavilion, bathhouse complex, and promenades.